For those of you who don’t know them: Klas is the go-to guy regarding 3D and effects (and much more), his trademark mustache and dark, curly locks. Marianne will tell you she’s PM, but quickly add that it stands for “Project Manager” and not “Prime Minister”. She handles papers and people in even measures. Now, leaving for a conference like GDC requires a lot of preparation. Especially when you’re exhibitors in the GDC Play area. How did each of you prepare for this journey? Marianne: I write lists of everything I’m bringing with me. Then as I pack I check things off, and usually check everything again three times before I leave. Klas: I panic. In the end I just find everything in the apartment and throw it in the general direction of my suitcase. Anything that lands inside, goes. Marianne: We had an early flight, and had to catch a very early train. So I went to bed early the night before. Klas decided to not sleep at all. We both made it. 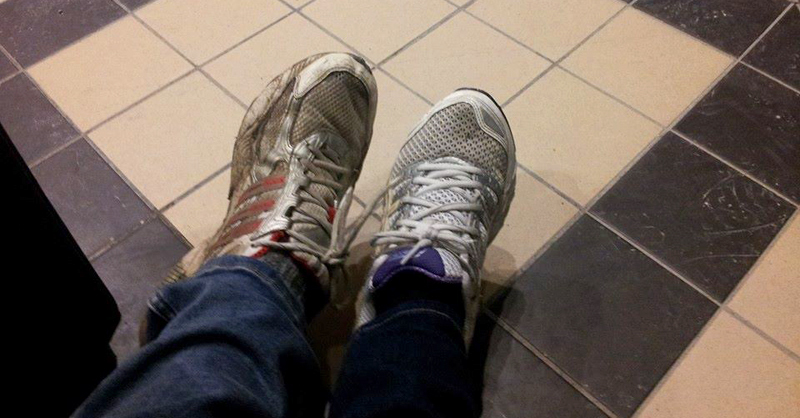 Marianne and Klas’ Pro tip: Always wear comfortable shoes to GDC. Picture taken at the train station before departure to SF. After a 20 hour long journey both of you arrived safely in San Francisco, and experienced your second GDC. The two of you have different roles at Sarepta. This also meant you had different tasks during GDC and GC. What were your main tasks? Klas: Fishing for visitors at the booth? Marianne: Yeah, you’re into fly fishing. Did you have any good ideas from fishing that helped you? Klas: Not really. Americans are easy to approach. Your eyes meet, you both nod, then you make the move and introduce yourself. Marianne: My main responsibility was to go to meetings. Klas: – And assist me covering the booth when I needed a break. You had my back. Marianne: Of course. That’s what it’s all about. During the week there is a lot going on. Do you have any favourite parts? Klas: I really like meeting many great people at our booth during the day, and socialising in the evening. And beer safari! Combined with socialising! Marianne: I love the possibility of meeting anyone, anywhere. And having lunches and dinners with cool and interesting people. Sitting down for once, just talking is really nice. It’s always good to schedule these things some time in advance. Once the week starts things are usually too hectic and all schedules are quite full. Klas: Oh, and winning an award! Marianne: YES! That was definitely memorable! 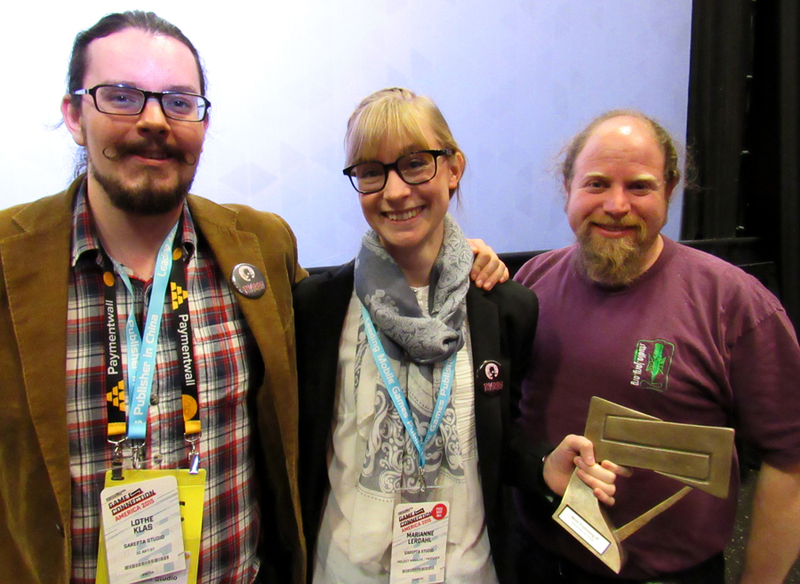 Klas, Marianne and sound guy Jory Prum posing with the award for “Most promising IP” right after the ceremony. You stayed in San Francisco for a week. Are there any particularly memorable moments you want to share? Klas: Apart from the award, there were many memorable moments. We had a really nice dinner with Jory Prum [renowned sound guy on Shadow Puppeteer], Adam Harrington [VO artist known for roles like Bigby Wolf] and Runa Haukland [CEO of Hamar Game Collective]. Klas: …everything was calm and pleasant. Marianne: And no events we had to hurry on to. But other highlights were definitely the Nordic Party and a Social mixer at Riot. Nordic has everybody we know, like a family coming together. Riot had a cool charity LoL tournament happening between Google and Facebook. Klas: Riot had good beers and knowledgeable bartenders. That always makes for a good experience. Unlike breakfast at Denny’s. Klas: I didn’t eat anything else for the rest of the day. My insides were on fire. 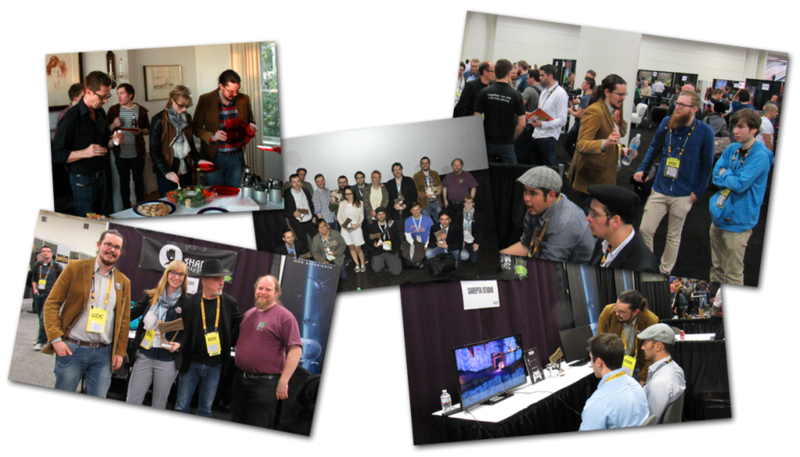 Every year new exhibitors and visitors attend GDC and GC. Do you have any advice or recommendations for them? Klas: It helps if you’re traveling and working with someone to try to keep a similar schedule. Going to bed and getting up at roughly the same time. Regular meal times are also good. Marianne: Yes. remember to eat and drink. Even though there is no time for such “silly nonsense”. As an exhibitor you’re going to be tired after long days at the booth, but go out in the evening to socialize anyway. You’ll regret it if you don’t. Some events are private and require an invite, others are available for all. You can usually find party groups on Facebook [search: GDC party] dedicated to bringing people together, sharing links to where you can sign up for different parties. It’s usually a good idea to sign up early, a couple of weeks before GDC as events can fill up. Klas: If you’re from a different timezone like us, just accept that there will be jet lag. You will feel terrible for a week. Final question: Would you like to go again to GDC and GC? Klas: Yes. As long as we bring an extra person to help man the booth. Marianne: Me too. And agreed. Even though you will be so tired and suffer from jet lag afterwards, it’s so worth it! And there you have it. If you have any additional questions about what it’s like to be at GDC and/or GC, write us a comment and we’ll be happy to reply.